Firstly, I would like to say thank God for such a website as recently I have been blazing through a couple of war and backstabbing episodes. I am 18 this year and I happen to work as a Captain (supervisor) in a French Dining restaurant. 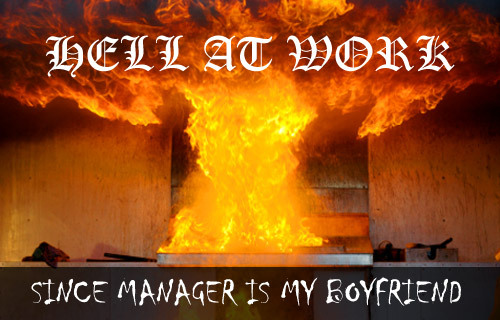 Honestly, it has been hell because my manager-in-training happens to be my boyfriend. I found myself in a difficult position because at times when he tells me off at work, it’s usually fired as ‘Neat’ and ‘Double Shot’ so as to set an example that he is no man of favoritism. However as time passes, I realize that it has always been at my expense without much validation, and it has been taking a toll on our relationship. I seriously don’t like it when he spits negative comments at my face but that seems to be his style of management. The ‘extra shot’ is on the house. Another thing — Is there a way for me to control my emotions when the pressure sets in? I do not wish to burst in tears but I am always at the brink of crying or bottling my emotions through the night about my management who has wronged me. What should I do? How should I balance my emotions? I never like to mix work with personal life, but I am stuck how should I handle those backstabbers who can be so pessimistic in life. Your situation sounds very challenging indeed – almost like a cross between “Throw-Down with Bobby Flay meets Dr. Laura.” But all office politics – whether they take place in the cubicle or the kitchen – really are matters of the heart. So let’s start with the boss/boyfriend. I doubt at this point it would do much good to lecture you about the (lack of) wisdom of getting involved with your supervisor, as it would appear you’ve already taken in some valuable life lessons that will probably not be repeated. Regardless of his relationship to you – personal or professional – verbal and emotional abuse is not healthy in the home or the office, so let’s discuss some strategies for how to handle this guy. Unfortunately, a cast iron skillet to the noggin is frowned upon in polite society. – I feel uncomfortable at the tone of the comments. – I feel that they don’t adequately reflect the quality of my work. – I perceive that the comments are unduly harsh. Assuming (and this is a big assumption) he is mature enough to handle rational feedback, he may open the dialogue for the two of you to come to an understanding about what is acceptable. I would hope it would improve your relationship both inside and outside of work. But what happens if he can’t handle mature feedback? You may have to make a choice between the job and the boyfriend. Getting out of both may be your best strategy, assuming you can find an equally acceptable job. If you choose to end the relationship but keep the job, let him know in writing (email or note), and keep a copy of the correspondence in a safe place. Also, document his behavior should he start to lash out at you at work. Then approach his boss (or if you have an HR function, approach them), sharing with them what has happened (with copies of the documentation). I realize that sharing your personal life with the boss takes a lot of courage, but his behavior may then be classified as sexual harassment (technically, it possibly could be argued it is right now). Most employers don’t want a sexual harassment suit on their hands and will deal with him quickly. Before you take action, you also may want to consult with an attorney on these matters. If there is a local university with a law school, see if they have a free legal clinic which can help you formulate your strategy and assist you. OK, we’ve taken care of the so-called boyfriend. Now let’s deal with the jealous co-worker. Managing others’ perceptions is tricky because 1) they may be leery of you if you try to do damage control; and 2) it sounds like she’s already feeling like the victim and is lashing out at you because of your relationship with le garcon. Perhaps if she perceives that you two are no longer a couple, it might help, since her beef appears to be with him more than you. You’re just receiving her residual frustration which she feels toward him. Unless she is actively attempting to discredit or sabotage you, you may be best just letting this situation work itself out, assuming that you are willing to end the relationship with the boyfriend. Based on what you said, my guess is that ending the relationship will also solve this problem. Now to your third question about dealing with emotions. Having dealt with a few difficult people and projects over the years, there are two approaches which have served me well: detachment and defense. To hone both of these skills takes practice, so don’t get frustrated if you don’t master them immediately. Detachment — emotionally remove yourself from the situation. It may mean putting up an “emotional force field” where you hear the comments being made but you don’t let them penetrate you. It may mean pretending that you are having an “out of body” experience and watching the situation like you’re an audience member watching a play. Either way, you find a way to emotionally distance yourself from what is being said and done. One of the reasons these people have power over you is that you are allowing their comments and actions to get inside your head and under your skin. By pulling yourself out of the moment, you regain the power. Defense – there are many great defense mechanisms, ranging from humor to a well placed look (“surprise” and “disgust” are great facial expressions to master). Having a good one-liner come-back may also work, depending on the individual. When my older daughter (a second-grader) got glasses over Christmas break, she was concerned that some of the kids would tease her by calling her “four eyes.” I taught her to get a look of happiness on her face while responding, “I’m SOOO proud of you. You learned how to count to four over Christmas break! That’s wonderful!” Then just walk away. And it worked. Any teasing was VERY short-lived. Again, it’s a question of maintaining power over the situation. If they know they are getting at you and pushing you to tears, they will keep pushing those buttons over and over … BECAUSE THEY CAN. By taking their power away from them, you remain in control of the situation. I hope these strategies help. I have been working for my company for 8 years now, and have enjoyed every minute of it, i am a training shop manager now, but 18 months ago everything went horrible, my shop manager become involved in a relationship with a man that works in the shop next door, they used have there dinners together in the shop, stuff went missing, we had to lye to cover for our manager, and one day the center cleaner was in our shop enjoying a coffee when the man next door totally went crazy blaming me off be lazy and being very aggressive and abusive towards me, this went on for a couple off months before i eventually told my husband what was happening to me, my husband went to see my manager and asked her could she have a word with her boyfriend, she said she would, but still it continued, my husband wrote head office to ask for help with this matter as he thought i wasn’t getting the right support from my shop manager, he got a letter back from the company saying there was nothing they could do because he wasn’t an employee of theres, but they would speak to the shop manager and have him barred, this happened and things got bit better but on Friday 2nd Oct 2010, thing got very aggressive to the point he has threatened my life his exact words (He his not going to stop unitl i am dead, dead) my work colleague witnessed all this, my manager who boyfriend it is ran away from the shop, leaving him in the shop with me and my colleague, i have been to the police the are being very supportive of me and are going to issue an harassment warning on Wednesday, i am still scared of what might happen, i havnt slept since it has happened, i feel sick to the stomach. Were do i stand as regards to my job and pay entitlements whilst i am off, the police have told me not to go back to work until the have spoken to him, can i be sacked. Thank you very very much for taking time to look at my matter, and will be very grateful for any help and advice you can give me. At this point, POLICE involvement, threatening your LIFE, is it really worth it? We all know of the stories where one of the employees went”postal” so to speak and actually killed people. Count your loses and move on. This is a very irrational man, and no matter WHO is his supervisor, he is too irrational to be supervised. Get out and NOW would be the operative word!